How a former Klansman and virulently anti-Catholic Supreme Court justice inserted the words “wall of separation” between church and state in a 1947 Supreme Court decision––a phrase repeated today by those who claim to stand for civil liberty. 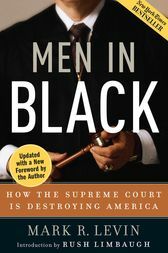 How Justice Harry Blackmun, a one-time conservative appointee and the author of Roe v. Wade, was influenced by fan mail much like an entertainer or politician, which helped him to evolve into an ardent activist for gay rights and against the death penalty. How the Supreme Court has dictated that illegal aliens have a constitutional right to attend public schools, and that other immigrants qualify for welfare benefits, tuition assistance, and even civil service jobs. Mark R. Levin is one of America’s preeminent conservative commentators and constitutional lawyers. He is the president of Landmark Legal Foundation, host of a number-one rated talk radio program on WABC in New York City, and a contributing editor for National Review Online. Levin also served as a top adviser to several members of President Ronald Reagan’s Cabinet, including chief of staff to Attorney General Edwin Meese. He is the host of syndicated radio show The Mark Levin Show, as well as Life, Liberty & Levin on Fox News.